Have you ever get a Premium tank you don’t like? Would you like to trade it in for a new one? If yes, then this is the perfect time for it as Trade-In event is back to World of Tanks. This event will only run from 25 January at 06:00 to 8 February at 06:00 CET (UTC+1). So get your old Premium tanks ready and receive new ones, at a reduced price! For example, you want to buy the Löwe, which costs 12,500 Gold in the game. In exchange, you want to trade in your old Dicker Max, which normally costs 3,200 Gold. 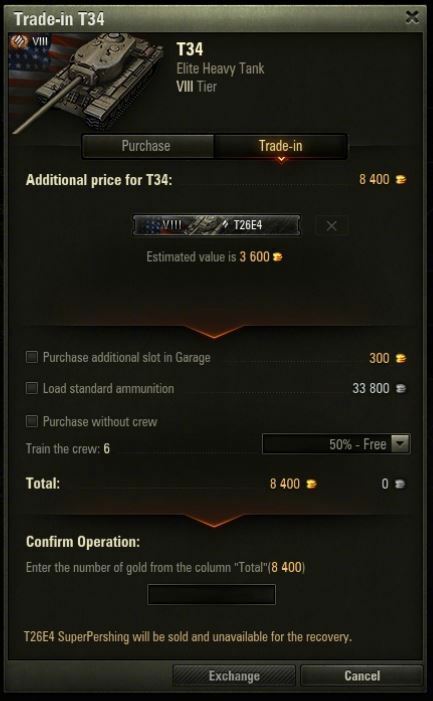 In this example, trading in your Dicker Max will yield you half of its price, which is 1,600 Gold. Consequently, your new vehicle’s price will be reduced accordingly and you now need 10,900 Gold for the Löwe. Forget TRADING!!! Just fix your old one!! Previous Entry Special (EU): Get Ready for XP Fever! Next Entry World of Tanks (EU): Free Tier VIII Premium Tanks?